Clic is unique hand-curated general store, bookstore and gallery all-in-one shop. When I walk into Clic, I imagine this is what a cool hip Soho loft might look like. Everything in the store seems to click (Clic!) together and you can potentially buy everything in the store to help you finish the look in your own unconventional adult apartment. I visited the store at the border of shopping mecca Soho and Little Italy but great taste travels and Clic general store can as well be found in East Hampton, NY all the way in beautiful St-Barts. The store sells home goods, accessories including men and women apparel, jewelry, kids’ goods. They also support local designers as well as artisans from all around the world bringing something fresh and unique to the table each season. During my last visit, what the store did not lack is sheepskin as there was a lot of it. Sheepskin rugs, stools, pillows even a decorative sheep outfitted in sheepskin was on display. There was a large collection of genuine sheepskin rugs made in England, Australia and Iceland. I even found the exact eco-friendly sheepskin rug I purchased in Iceland last year but at double the price. However, it’s cheaper than a plane ticket to Iceland no? There are also large art pieces to inspire and natural wood furniture to keep you grounded. Lots of throws and tapestry to keep things cozy and some accessories like hats and jewelry to get conversations started. 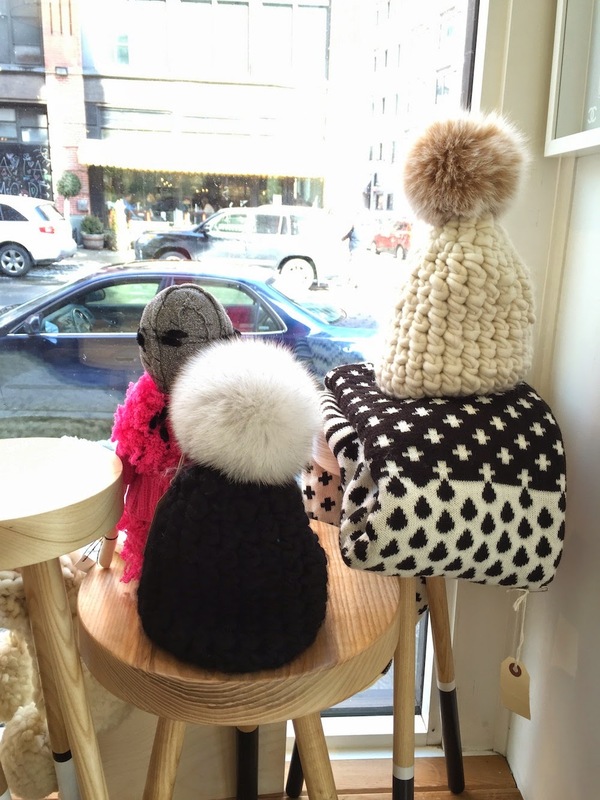 For the winter, a display of Mischa Lampert's hand-knitted merino wool beanies topped with fur pompoms are sprinkled throughout the store and I cannot help but pat all of them to the store owner's dismay. Whenever I'm in the area, I always make a point to visit the store for some home decor inspiration. If I save up enough, there are some pieces I would love to invest in and cherish for as long as I can. Too bad I'm so cheap all the time!